She's savvy, she's sleuth-y, she's Natalie Fuentes. Trouble sticks to 16-year-old Natalie Fuentes like glue to paper. As the new kid at Western High, there's nothing she'd like better than to avoid making waves and instead focus on My Very Secret Life, her self-published zine. But when the school's reclusive caretaker is brutally attacked, Natalie is the only person who seems willing to investigate. Armed with the clues found in her zine's clippings, pictures and notes, and with the help of the caretaker's socially awkward son, Natalie searches for answers. Soon the two are stirring up secrets that others including the school's most infamous "cool girl" clique -- want kept under wraps. When the trail leads to the police-shy leader of a local graffiti gang, Natalie must use all her streetwise wiles to crack the case. 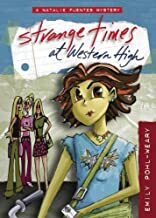 Illustrated with snippets from Natalie's zine, and with a fast-paced plot that will keep readers guessing, Strange Times at Western High is as spirited as the savvy sleuth herself. About Emily Pohl-Weary (Author) : Emily Pohl-Weary is a published author of young adult books. Published credits of Emily Pohl-Weary include Strange Times at Western High (A Natalie Fuentes Mystery).